As fur parents to two cats and two dogs, Mike and I are often busy walking, feeding, and playing with our animals. Each of them have very distinct personalities, different quirks, things they like and things they don’t like. For much of the first year we had our dog Artie, he loved to take long walks with us, and our other dog Olive. He was always very friendly to other dogs and people, and we had no issues taking him out. I even brought him to dog friendly patios and markets, often! But something changed as Artie got older. He’s 3 years old now, and over the last year has gotten more anxious, aggressive, and reactive on walks. We don’t know what happened, and it breaks my heart that we can’t go for long walks like we used to. (Literally, cried writing these introduction sentences). But we’ve been trying different tactics to see if any can calm our boy on walks. We’ve tried calming treats, we’ve tried different leashes, we’ve tried different walking routes. 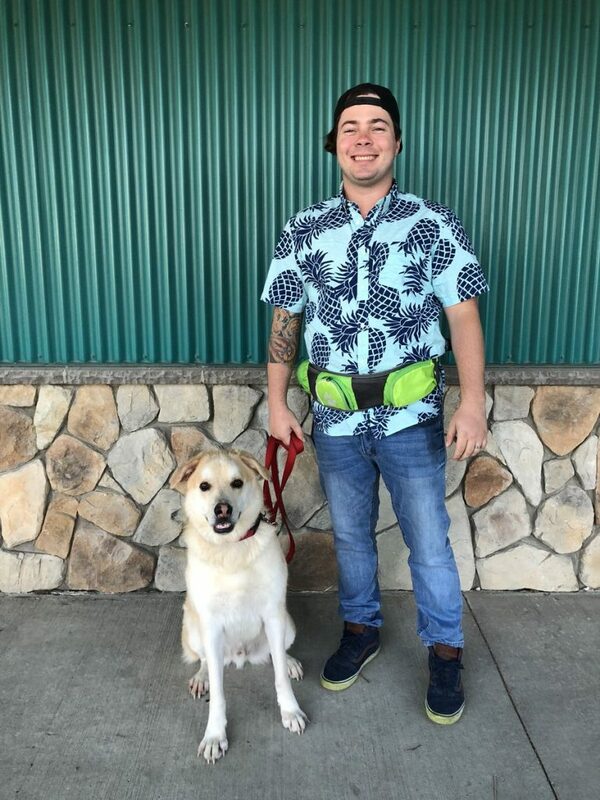 And we’ve tried the topic of this blog post—Leash Reactivity 101 class at the Edmonton Humane Society! Note: we received these classes for free, in exchange for providing a review of the experience on social media and this blog. 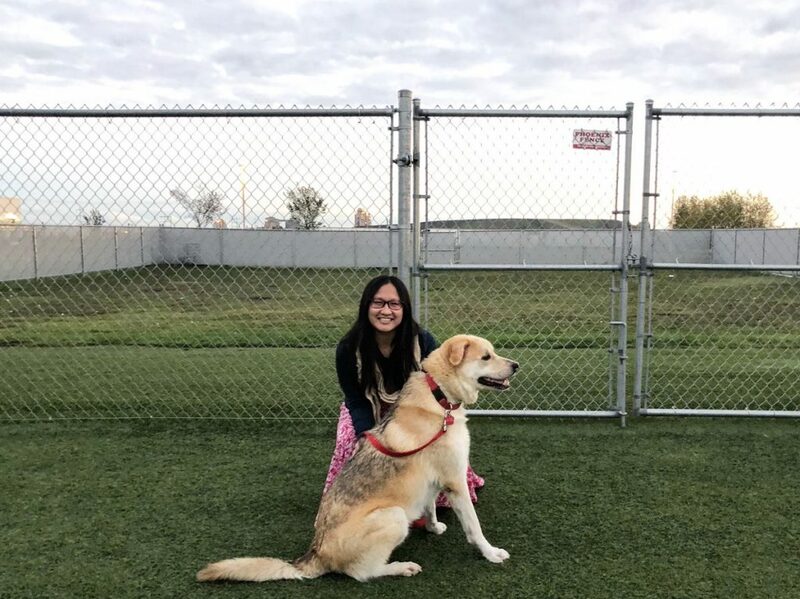 The Edmonton Humane Society offers a bunch of different group training classes, from Basic Obedience to Managing Mischief, Scent Detection and the Leash Reactivity class we enrolled Artie in. Leash Reactivity is for dogs who react aggressively around other dogs (or people) while on a leash. The reaction can be in the form of barking, growling, lunging, snarling, snapping, or any / all of the above. The Edmonton Humane Society offers a 6-week Leash Reactivity program (one class per week). When I saw them tweet about the upcoming class, I wondered whether it could help my sweet, but reactive boy. 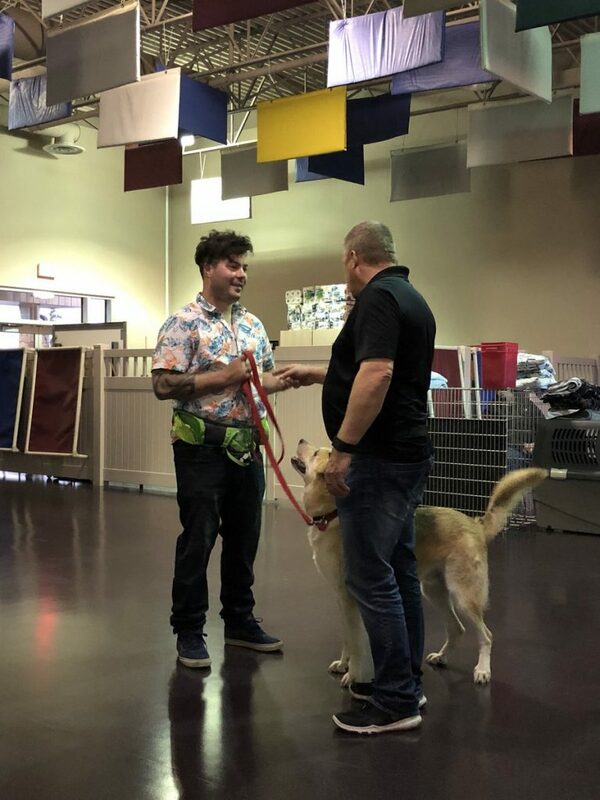 The first class is just for paw-rents, where we talk about what Leash Reactivity is, and the instructor, Michael Foote, lets us know how the next few weeks are going to go, and gets a bit more information about each dog. Artie is reactive towards three main things on his walks: noises, other dogs, and people. We learned that some dogs are reactive in close distances, some others can get reactive if they see something triggering from faraway distances. In these classes, we were told we’d use clicker training, along with a series of mostly focus-based techniques, to attempt to tackle Leash Reactivity. Over the course of the six weeks, we worked a lot on Artie’s focus. 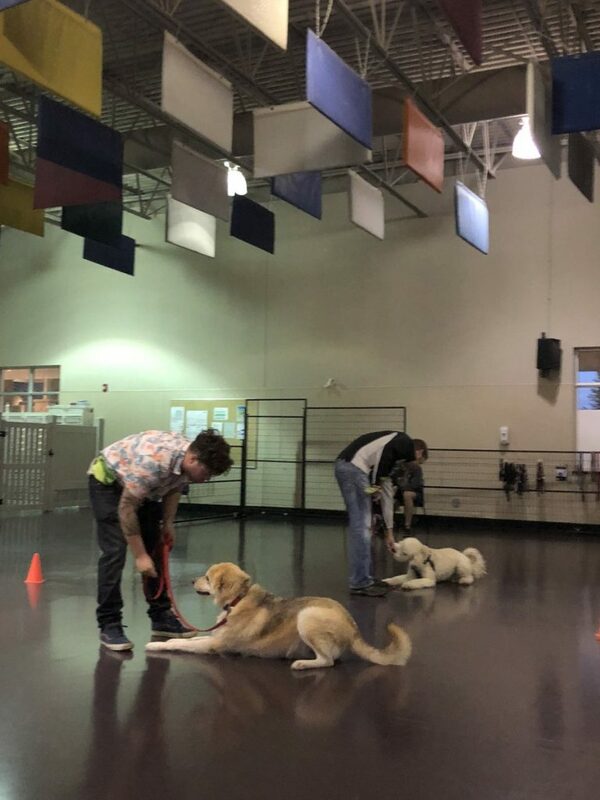 This focus training was to help ensure paw-rents could get their dog’s attention before or even during a reaction to help mitigate or eliminate the reactivity altogether. We also tried to improve the bond between dog and paw-rent—we started hand feeding Artie using a clicker for the six week duration of the class. This also teaches Artie that if we put our hand out (with or without food) and use the clicker, he should pay attention to us (and not whatever he might be reacting to on the leash). Some classes the instructor and volunteers also brought out distractions to try to challenge the dogs—babies in strollers, fake small and big dogs, people on bicycles. Some dogs would lunge, some would sniff, some would just bark. There were agility portions of the class, which were always really fun, and a good way to in still more confidence in the dog (one of the reasons they may be leash reactivity is a lack of confidence), and also activities where different dogs would be asked to do different tasks while other dogs walked around them (to see if it would be triggering / to see how well we could hold our dog’s attention). Something I wish we had done a bit more of was getting the dogs to greet each other on leash, to see whether they would react aggressively. We only really did that one time (it did not go overly well lol), but I wondered if practicing more of that would have helped. Artie focusing on Mike while other dogs are nearby! Overall, the repetition, structure and new focus techniques we learned in the class, we think were really valuable. Leash Reactivity is not meant to be an obedience class, and Artie’s obedience commands were pretty good already, but out of the class Artie also learned some new obedience tricks (and is a pro at waiting to eat his food now, in particular lol). I am happy to say that after six weeks of training, Artie’s leash reactivity seems to have been reduced around other people and dogs (for the most part—it’s not completely reduced though), but unfortunately his reaction to noises is still alive and well. I’m happy we’ve made some strides with his dog and people aggression, picked up some new focus techniques and clicker training along the way, but still sad that noises on the street are triggering his anxious reactions. 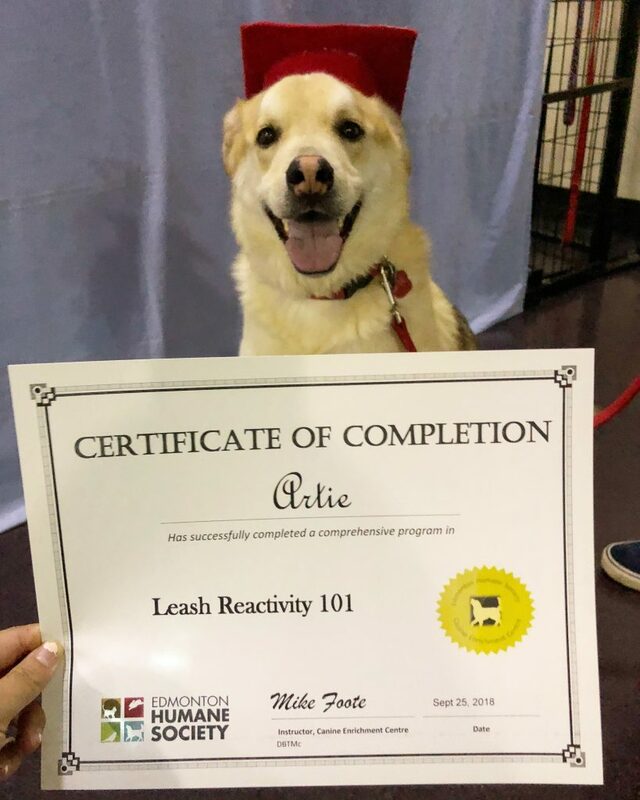 Artie’s Certificate of Completion! What a good boy. 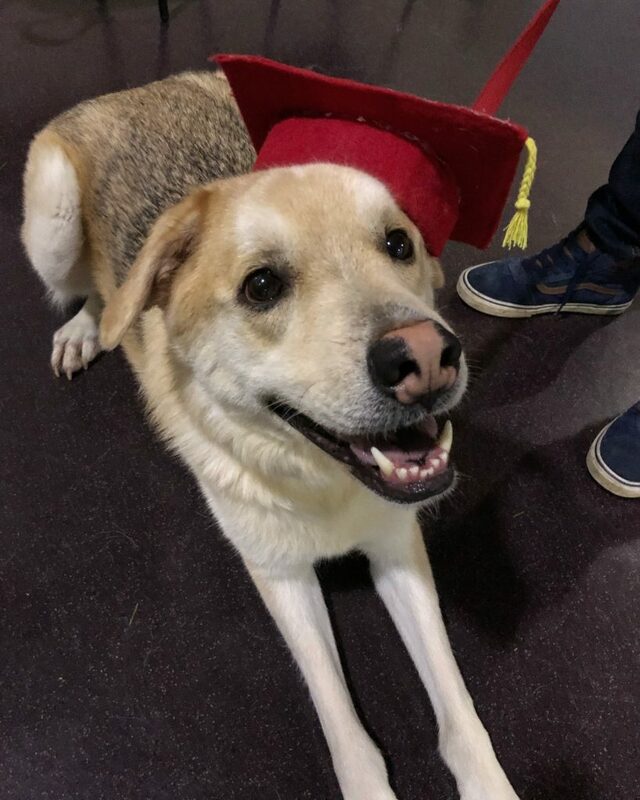 On our last day of class, where my cutie got a little graduation certificate and grad cap, some paw-rents were asking the instructor ‘what’s next?’ for their dog. I think every dog had made some great improvements with the class, but we were all wondering whether it would stick—or get better now that the weekly class was over. Our instructor said, in order to see improvements, we need to stick to the training now that the formal class was over, which makes sense. It’s like anything, if we don’t stick with it, then it won’t work. Keep clicker training, keep doing focus techniques, keep introducing potentially triggering distractions in safe or controlled spaces to test reactions. And after a few weeks of that, email or call for an assessment and to see what a next best step might be. I personally think we need to get Artie one-on-one training, where the trainer comes with him on his regular walk to see his anxiety in action. If he’s able to address whatever is happening to our boy in the moment that it’s happening, maybe he can make some improvements then and there. We’ll keep trying to help my boy until we’re able to go on long, anxious and aggression-free walks again. We’re happy we tried the Leash Reactivity class at the Edmonton Humane Society. We think it taught us things that we didn’t know before, and it was a good weekly bonding experience with Artie. While we saw some improvements, it didn’t solve everything, but we didn’t expect it to erase all the problems. With every ‘thing’ we try, we know we’re one step closer to helping our boy. We would definitely recommend the class (group training is so much more affordable than one-on-one training!) if your dog is being leash reactive and you’re looking to better understand why, and how to mitigate or eliminate it. Thank you to the Edmonton Humane Society for partnering with me on this class (and the subsequent social media posts). Mike, Artie and I learned so much over the six weeks, and fingers crossed we continue to see improvements with Artie! Click to read my weekly tweets about the classes, as they were happening! Click to see my weekly Instagram Story posts about the classes, as they were happening! 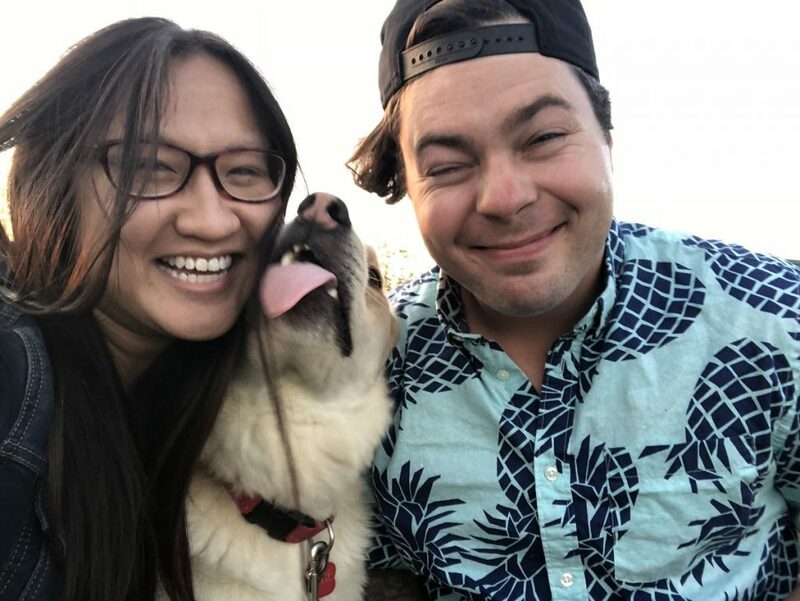 Click to view Edmonton Humane Society classes and use my promo code LindaHoang@EHS2018 to receive 15% off any online booking! 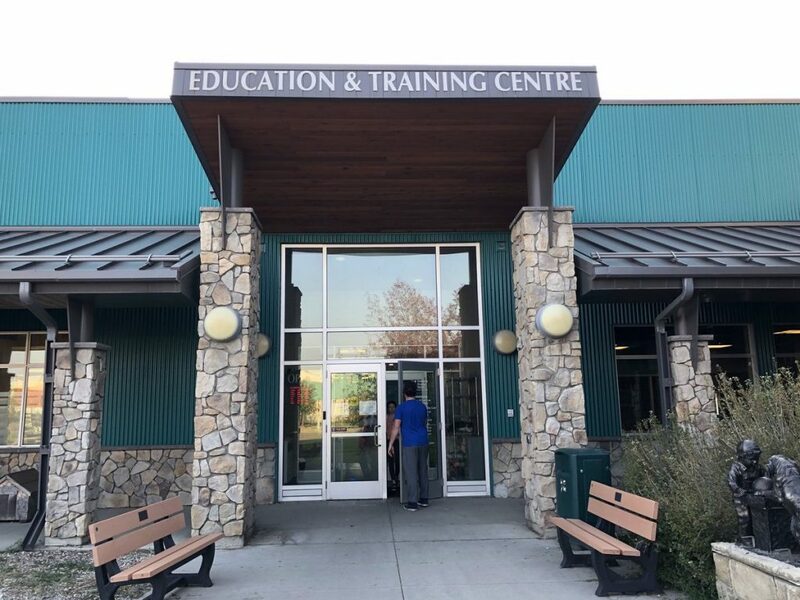 Disclaimer: This blog was posted as part of a partnership with Edmonton Humane Society—highlighting one of their training classes in exchange for social media coverage of the class.This has no impact on opinions stated in this post. We learned a lot in the Leash Reactivity class, and saw improvements with Artie, though it did not fix all of his problems.